Sign the petition to block the TPP. Update: VICTORY! Thanks to the pressure you and others put on Congress, we have defeated the TPP! The Trans-Pacific Partnership (TPP) is an international treaty, often called a “trade agreement,” that was negotiated in secret for five years behind the backs of congress and the American people, but with the help of hundreds of corporate advisers. Now that we can read the text, we see that it undermines democracy by entrenching corporate power in virtually every area of our lives: from food safety and the environment, to worker rights, internet freedom and access to health care. 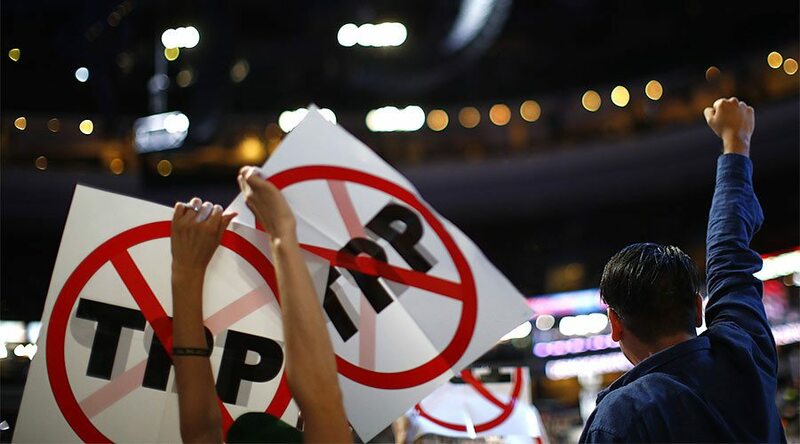 The TPP is about much more than trade. It is a global corporate coup. Congress members are in a key position to stop the TPP because both the Senate and House will be voting to pass the deal in November. To counter the influence of Obama, big money, and corporate media we must apply pressure to Democrats and Republicans in the House and Senate to make sure they stand firm against these dirty deals when they come to Congress. We must pressure congress to vote NO on TPP before the lame-duck session this November! The following information is provided by Flush the TPP. The TPP places the profits of multinational corporations over the food security needs of individual nations. Negotiated by Big-Ag, including Monsanto, Dupont, Cargill, and Syngenta, the TPP allows corporations to sue governments (including local and state governments) who pass food safety regulations or laws protecting family farmers, claiming they are “barriers to trade” that hurt expected future profits. The TPP will offshore more U.S. jobs to low-wage countries by giving special privileges to corporations and eliminating the risks of sending jobs overseas. Corporations like Walmart will move labor to countries such as Vietnam, where wages are already half that of China. The TPP also lets corporations sue countries for lost profits caused by labor laws, which will hinder safety regulations that prevent the kind of disaster that took place in Bangladesh on April 24th, 2013, where more than 1,000 died in a building collapse. According to leaked documents, the TPP would establish international trade tribunals with more power than governments by allowing corporations to sue governments whose laws or policies adversely impact “expected future profits.” Similar provisions in NAFTA have resulted in the overturning of many environmental and consumer protection laws. Judges in this system would consist mostly of corporate lawyers on leave from their regular jobs with multinational corporations. In this rigged system, appeals would not be allowed. The TPP allows corporations to sue governments in special corporate trade tribunals if their environmental laws or policies are deemed to negatively affect profits. Laws restricting air and water pollution or favoring clean energy could all be challenged under the TPP’s “investor state” provisions, making it virtually impossible for countries to protect the environment and mitigate climate change. If a domestic court holds a corporation liable for environmental contamination, even that decision could be appealed to the corporate tribunals. These measures are modeled after the unpopular U.S. Digital Millennium Copyright Act, and would become impossible for Congress to change if ratified by the TPP. Other countries with less restrictive laws would also be forced to change them to adhere to the TPP. Through a process called “evergreening,” pharmaceutical corporations are pushing for never-ending patents to prevent generics and keep drug prices high. Medical devices, laboratory tests and even surgical procedures will be patented, restricting their access to people around the world. The TPP also allows Big Pharma and private insurance corporations to challenge prices set by public health systems, which may easily lead to increased privatization of health care. The TPP will undo the already inadequate regulation of Wall Street and prevent member countries from banning or regulation speculation and the toxic derivatives that led to the 2008 financial collapse. The separation of commercial from investment banking would also be prohibited. Government efforts to impose a financial transaction tax or “Robin Hood tax” would be banned and public banks and red unions would be prohibited from loaning money below “market” interest rates. The TPP would also allow corporations to move money in and out of countries with greater ease to wherever wages are lowest, resources cheapest, and laws the most lax.